Recommended for women with a history of miscarriages or for women whose offsprings die at birth or born weak. 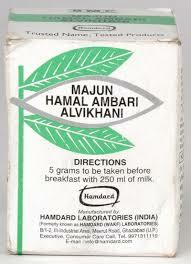 5 grams to be taken before breakfast with 250 ml of milk. PRODUCT DESCRIPTION: Strengthens the uterus. Recommended for women with a history of miscarriages or for women whose offsprings die at birth or are born weak. INDICATIONS : Atony of the uterus and threatened miscarriage. DOSAGE : 5 g with a glass of milk in the morning from the 3rd month of pregnancy to the end of the 7th month of pregnancy. Uterine atony is the most common cause of postpartum hemorrhage and the most common indication for postpartum hysterectomy or blood transfusion. Normally, bleeding after delivery is stopped by uterine contractions and compression of the vessels. If uterine contractions are not adequate, bleeding can continue. At times, the uterus is prevented from contracting effectively by fragments of placenta that remain in the uterus after delivery or by benign growths of uterine muscle within the uterine wall (fibroids). In these cases, the term ‘atony’ usually is not applied. In most cases, the uterine muscle simply fails to contract adequately.